British Columbia, Canada's most western province, has a breath taking natural beauty that must be experienced to be fully appreciated. Spectacular landscapes sweep from seashore to great mountain ranges, to raging rivers, great tranquil lakes, lush green valleys, and open grass lands in the northern regions. It is also home to a wonderful, diverse wildlife population, in which Black Bears stand out as one of the largest and most prominent species in the region. According to surveys, one quarter of all Black Bears in Canada are found in BC. Bears have roamed North America for millennia, living in harmony with nature and coexisting with all other life forms - until man came on the scene, that is. As civilization encroached more and more on the habitat of these powerful, and impressive animals, conflict between them and human settlers was inevitable. Not only did bears and people compete for territory, man also did what he does very well, hunt and kill them for his own devious purposes. Fundamentally, little has changed for the bruins since the settlement of this continent, but they are still here, and they do make their presence felt. It is important now more than ever to consider their needs in the wake of a year of draught and the ravages of devastating wildfires. The Summer of 2003 was a season of extreme drought in BC, with the lowest registered precipitation in recent memory. It created hardship for all wildlife, and the bears were no exception. Although bears belong to the order of Carnivores, they are actually Omnivores, and plant foods make up the bulk of their diet. So with their berry patches' dried up and a scarcity of other vegetation due to this summers unusual heat wave, the bears had to forage over large areas to find remnants of their preferred foods. Due to low water levels in woodland streams, even fish were hard to come by for the bears. To survive they relied on their keen sense of smell and their ingenuity, to survive. They wandered more often than usual into backyards, farms, campgrounds and even into semi urban areas, anywhere they could find food. Bears have an incredible sense of smell; their noses pick up the aroma of human garbage and other potential food sources over great distances. They are intelligent and persistent, and will return to a food source until it is gone. The come to feed, not to attack humans. "I believe that we need to be a lot more sympathetic about what the bears have suffered these past months, and more tolerant when they infringe on our 'habitat'. The supposed danger these 'refugees' pose is often exaggerated. A bear may act aggressive when cornered, but will rarely attack," according to the observations of a well respected Wildlife Biologist who is also involved with several conservation groups. 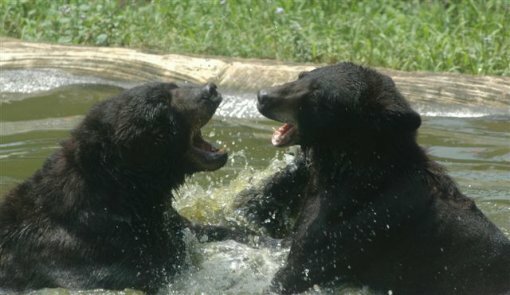 Black Bears are not "cuddly" Walt Disney' characters, they are very powerful and intelligent animals; people do well to respect that, but fear of these creatures is generally unwarranted. According to the BC Vital Statistics Agency, in a period of about 30 years (1969-1997) five human fatalities resulted directly from encounters with Black Bears in BC. (Grizzly Bear attacks and subsequent fatalities were more numerous during the same time period.) "Each year in the US and Canada 1 in every 16,000 people commit murder; 1 in every 35,000 Grizzly Bears has killed a human; one in every 100,000 black Bears has killed a human. (US Department of Justice) Since every single Black Bear/Human encounter is widely covered by the entire spectrum of the media, it creates the impression that these encounters are far more wide spread then they actually are. The summer continued hot and dry into August this year, and then came the Wildfires. They devoured many thousands of hectares of forestland, and in one instant destroyed an entire small town in BC. The fire-ravaged woodland is desolate, totally silent, and only scorched tree trunks stretch toward the horizon. There is not any living vegetation for miles - even the rocks are black. Whatever creatures have lived there, are either dead or, if they were lucky, have escaped to less affected regions, where they have to compete with those who are there already. With their already compromised habitat now destroyed by fire, the immediate future for the Black Bears looks dismal. Bears hibernate beginning about November, and they stay in their dens until early spring. It is imperative that the bears have a sufficient food supply to gain enough weight to last the winter month. "Up to 30% of body weight is lost while denning." Female bears undergo delayed implantation of fertilized eggs, and they do not develop into embryos until the beginning of hibernation. In the case of a female bear not having gained enough weight, her embryo will not develop, and there will be no bear cub from her in the spring. Wildlife experts expect that in the spring of 2004, fewer bear cubs will be born than in previous years. To add insult to insure, BC has two yearly bear hunting seasons, one in the spring and one in the fall. The fall hunt began in September and will end in late November. The spring hunt, beginning in April, and ending in June, has raised considerable protest in the past, but so far, it goes on. Even now, after the bears have already suffered severely (yes they do feel pain and the misery of hunger) humans will stalk and kill them for sport. No, there is no other reason; no one needs to hunt the bears for food - or for the need of their pelt. Hunting is a business, for government and for a variety of private enterprises, it is not a necessity for human survival. Out of eight "Resource Management Regions" in British Columbia, four of them experienced extreme wildfire damage. No initiative has been taken to cancel the spring bear hunt so far. This is not a numbers game, it is simply un-ethical to further harm these animals for no other reason than to satisfy one segment of the population to pursue it's selfish pleasure at the cost of animals who's survival has already been made difficult by natural forces. It is hoped that readers of this article will be interested in finding more, detailed information about BC's Black Bears, not because they are an endangered species, but because they are wonderful, impressive animals and understanding them better will improve human/Bear relations, Also, anyone who feels that the "Spring 2004 Black Bear Hunt" should be cancelled, please write to the address provided.